It’s ironic the way Mother’s Day works... and sometimes doesn't work. But then, they get older and venture off to start their own lives and all we want is to be with them and to hear those same voices from the next room. This is my first Mother’s Day in this category, the first time celebrating this blessed role of mom without one of my sons. Maybe you’re there, too, or soon to be. If so, take heart. Let me just say that for some of us, getting to a place of acceptance about this doesn’t happen without first being in a place of sadness. That would be me. It’s not surprising. I'm a sap. Full on. I’m the mom who, at the end of summer vacation, hated to give my kids back to the school year. As many of my dear friends gleefully dropped their children off and sped away for the first day of mama freedom, I slowly drifted away with a tear in my eye. I longed to savor every minute I had with my “babies,” knowing the fleeting nature of parenting. So now, with both of my sons out of state, I’ve been teary about not spending Mother’s Day with two of my favorite people on the planet, the ones who made me a mom. There’s no practical way to change our proximity, so the only thing left to do is to feel the feelings and then, when I’ve had enough, change my perspective. I know this because I’ve been here in this Mother’s Day funk before. Many years ago, Hubs was on a business trip to China when the holiday of mamas arrived. Our firstborn was three, too young to do much celebrating and I was on full time, single-parent duty. I was doing a pretty admirable job of being a good sport about it. But then, the morning continued on and there was no card from Hubs. No flowers. No phone call. No mention. Just me taking care of our son like any other day. I’m not sure which I felt more strongly: anger or hurt. Let’s just say I was full of both. And the day felt like it was ruined. I did what any semi-respectable mom would do and closed myself behind the bathroom door and cried. Then, somehow, my emotions began to work for me instead of against. Hell no, I thought. I will not let this day be ruined. If I have to put on Mother’s Day for myself, then I will. I splashed my face with cool water and started to think about how to salvage the day. Solely because of this mindset shift, this unorthodox Mother's Day ended up being one of my most special. I decided to create a painting with my three-year-old. In bright blue and red and school bus yellow, we painted our hands and feet and stamped them on a big canvas until it was covered with… us. We picked up some goodies for lunch, rented a little motor boat and had a floating picnic on a lake, something we had never done before. The day wasn’t perfect. The motor ran out of battery and I had to row upstream with one paddle to get us back to land. Then, when we finally arrived, the rental person had given my driver’s license to another boater who had already left with it. While those frustrations pulled at my patience, I bit my lip and refused to let them ruin or even take away from my day with my boy. 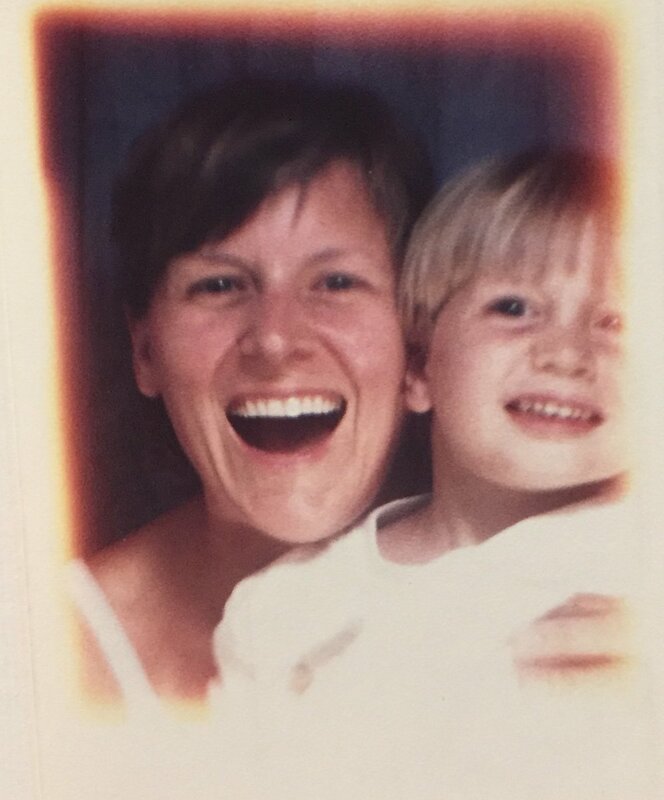 We ended our day perfectly with ice cream and pictures in a photo booth (above) to remember it all, this beautiful, painful, special Mother’s Day that was salvaged because of one decision: to make my own day. The bottom line: I tried something new. I took care of myself. Read that again, mamas. Slowly: I took care of myself. Novel concept, right? It is for a lot of us, but I’m learning. I'm adopting that same mindset this year, as I prepare for my first Mother's Day without my son’s bright smiles and warm hugs to usher it in. Perhaps I’ll mother myself, something I am learning to do, embracing it as a premature empty nester. I’ll also take time to remember my own mom who has passed from life to Life, to honor my birth mother who gave me life and my family, and to recall every woman who has mothered me in some way. When I think about them, about our sisterhood in motherhood, and the sons God entrusted to me, I feel gratitude that runs to my core. And that alone will make it a very good day. Counting our blessings always has that affect. Plus Hubs, who has never forgotten a Mother’s Day since that early time, has something special planned. I love that he sees my struggle and wants to make it a little better. We learn, we grow. And, even though it will be through a phone line, I will hear my sons’ voices and absorb their I love yous. Again, it won’t be a perfect day, but it will be a good one as I look at what I have instead of what I don't have, the way I eventually did way back when. Like motherhood, life is a great teacher. Happy Mother’s Day to all of you who have children, small or grown, to all of you who mother in a variety of ways to a variety of people, to all of you thinking about your own mama, and to those of you salvaging the day and taking care of yourself. Shift your mind. Your day matters, even if you make it so yourself. And this sister-mama sends you love as you go.